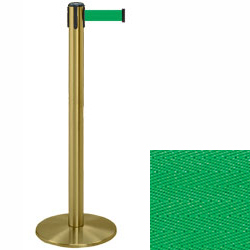 Our satin brass Tensabarrier stanchion with 7 1/2 foot green retractable belt is a great color combination for a classy look that offers a touch of color. 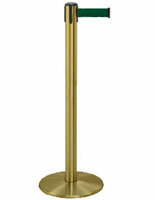 This is an ideal product for airports, restaurants, bars, registration lines, hotels and virtually anywhere else. The posts offered by Displays2go have led the industry for several years, are the highest quality and best looking. 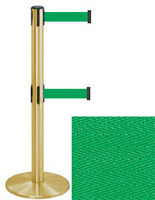 This stantion measures 38" tall, has a 13 1/2" diameter base, and weighs 24 lbs, the belt is approximately 2" wide.